Residents came out Friday evening for the first night of the 2018 Scarecrow Festival. One of the returning acts to the festival was Irish dancers from the Nugent School of Irish Dance who entertained the crowd with fancy footwork and traditional Irish music. The annual Scarecrow Festival kicked off in downtown Washington C.H. on Friday with much more to come today and Sunday. Today will begin with the United Way of Fayette County’s 5K Walk/Run at 9 a.m. downtown with registration beginning at 8 a.m. The run/walk will begin at the intersection of Court and Main streets, and according to Bryant, all participants will receive a finisher’s medal, t-shirt and swag bag, with awards to be given out for first, second and third place finishers, both male and female. A multitude of rides, vendors and amusements will open at noon and be available until 11 p.m. Face painting and a balloon artist will be on the courthouse lawn from noon until 7 p.m. Kids’ activities, sponsored by Head Start, will also be on the courthouse lawn from 2-7 p.m. Stilt walkers will entertain the crowd from 2-6 p.m.
Beginning at 2 p.m., the musical entertainment will kick into high gear with Angela Jamez on the main stage. From 4-5 p.m., the Temple Street Howlers will entertain on the main stage, followed by Flippin For Fun(ds) from 5:30 to 6:30 p.m. The beer garden will be open from 6 to 11 p.m.
Jonalee White and The Late Nite Drivers, featuring Shane Runion, will take to the stage at 8 p.m. as the opening acts for the headliner. With over 150,000 spins at country radio, White has had five Top 40 singles from her eOne Entertainment distributed sophomore album, “Sugar,” via Lick Records. Along with the CMT debut of her music video, “Naked As Fools,” she has acquired a significant fan base, performing with such artists as Dierks Bentley, Charlie Daniels and Taylor Swift all over the US, according to her bio. White’s band, The Late Nite Drivers, include Columbus-based musicians Michael Nugen (electric guitar), Molly Pauken (bass), Kay Harris (mandolin), Pete Cary (acoustic/electric guitar), Nate Hollman (keyboards), and Barry Damron (drums). According to her bio, White has been a finalist on both NBC’s Star Tomorrow and CMT Music City Madness. Finally at 9 p.m. is the main draw of this year’s Scarecrow Festival — country music star John Michael Montgomery. Since the days when “Life’s A Dance” turned Montgomery from an unknown artist into a national star, the Kentucky-born artists’s rich baritone has carried that most important of assets — believability. Songs like “I Swear,” “I Love the Way You Love Me” and “I Can Love You Like That” still resonate across the landscape, according to his bio. Now, with the release of Time Flies, which he co-produced with Byron Gallimore, Montgomery takes another big step forward, strengthening his position as one of the most versatile and compelling vocalists on the country scene. Montgomery has sold over 16 million albums and has had 15 number one singles. On Sunday, the fun will continue as rides, vendors and amusements open back up at noon. From 12-4 p.m., a car show will be held, sponsored by Hixon Towing, on South Main and East streets. At 1 p.m., there will be a worship service on the main stage. From 2 to 3 p.m., there will be a meet and greet with the local fire, police and EMS departments on South Main and East streets. The 2018 Scarecrow Festival will wrap up with a performance from the Washington High School Marching Band on Court and Main streets at 2:15 p.m.
https://www.recordherald.com/wp-content/uploads/sites/27/2018/09/web1_20180914_191252_056_01.jpgResidents came out Friday evening for the first night of the 2018 Scarecrow Festival. 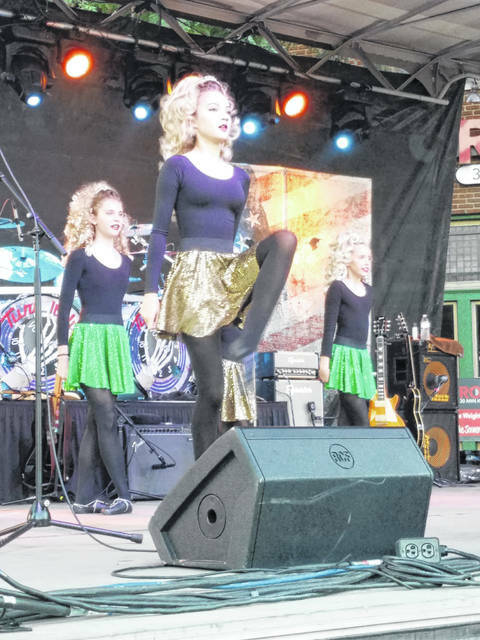 One of the returning acts to the festival was Irish dancers from the Nugent School of Irish Dance who entertained the crowd with fancy footwork and traditional Irish music.